You’re reading this on a niche music website, so it’s safe to assume you’re aware that Adele’s 25 beat out Lemonade, as well as albums from Drake, Justin Bieber and Sturgill Simpson for Best Album. 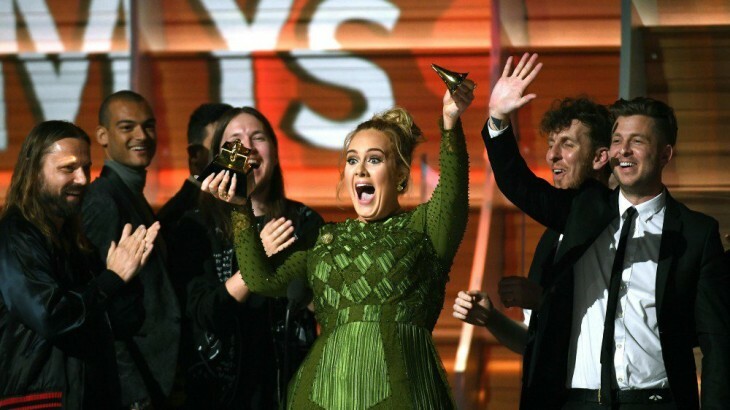 People have criticised the Academy for giving the prize to Adele in the same way the criticised the Academy for choosing Taylor Swift over Kendrick Lamar last year; we don’t need to spell it out for you. Her comments were part of what became an inevitable debate over whether Adele “deserved to win” over Beyoncé, with many noting that, while her album sold a helluva lot more albums than Beyoncé, it didn’t hold the same cultural, political or even artistic relevance and ferocity that made Lemonade so great. 25 didn’t really top many critic polls, while Lemonade topped, or near-topped most. Many celebrities chimed in too, as they did when Kendrick lost to Swift (and when he lost to Daft Punk in 2014). Many points were brought up on both sides of the argument, from sales-based reasons to the more sinister race-based ones. The more radical Beyhive members went so far as to slam Adele for being untalented. And so on. In some ways, Santana’s comments were correct. While not expressed terribly well, the core idea that Adele is primarily a singer and Beyoncé is primarily a performer makes sense in that Beyoncé’s shtick travels far, far further than simply singing; her output focuses as heavily on the visual aspect, including the full-length Lemonade visual album, her monumental live performances, outfits and so on. Adele, meanwhile, is fairly bells-and-whistles free, on stage and on record. Santana praises both artists, but he also wildly misses the point. Santana’s argument implied that the Grammy voters viewed Beyoncé is less naturally talented than Adele, because she incorporates the “model”-like bells and whistles. He implies that Adele’s victory was solely because she is a fantastic singer. But this sets up a double standard. Everyone was quick to clamour that artistry matters more than commercial success when Beck beat out Beyoncé for Album of the Year in 2015, but when Taylor Swift won with 1989 over To Pimp A Butterfly? Crickets. To say that it’s just talent is both blind and naive. While it’s easy to take each award as it comes, a quick look at past winners highlights some worrying trends. A black woman hasn’t won Album of the Year since 1999, and a black artist – of which there have only ever been ten winners – hasn’t won since 2008 (and it was a Joni Mitchell cover album). Paul McCartney has more Album of the Year Grammys than every woman of colour combined. I could go on. This whole affair smells strongly with the #OscarsSoWhite controversy, albeit with a lot less insufferable thinkpieces being written about them (and yes I am aware of the irony of stating this in my own insufferable thinkpiece). Both major academy awards appear to have a problem with diversity. The Grammys have been whiter than the Republican Party in a snowstorm for ever, and it’s only been in the last few years that people have begun to notice. But as the debate barges its way to the forefront of the popular consciousness for another year, we need to be wary not to turn it into #GrammysSoWhite. Not that the campaign was a bad cause or anything, just that it, along with Santana’s comments, kind of missed the point. As Vince Mancini‘s fantastic article about the #OscarsSoWhite controversy addresses, the issue is not with the awards. It’s with The Academy. To pinpoint the problem with why racial minorities (particularly black artists) are so under-represented in the awards, you have to look behind the curtain. The Grammy winners aren’t chosen by a mystical and omnipotent being who knows all music and decides on the objectively best one. No, the winners of the awards are chosen by a little organisation called The Recording Academy. And it’s here where the real problems begin to appear. The problem is with the voters. Well, not the voters individually, but rather the voters as a whole. If we take a literal black and white approach to the situation and group the majority of mainstream music that gets Grammy recognition into “black music” and “white music,” and then apply this to the tastes of many people in positions of power in the music industry… well let’s just say it doesn’t look good for “black music.” This is, of course, ignoring a massive amount of people whose tastes aren’t what you would expect just looking at them (I’m a white guy typing to Migos at the moment, so sue me), but the broad sentiment remains. Not every voter knows about artists who don’t fit in line with their natural music tastes. Side note, does anyone know who Sturgill Simpson is? Asking for a friend. The Recording Academy has never publicly released the statistics for the demographics of their members, but they do allow anyone with 12 credits on digital tracks or six credits on physical tracks to join their ranks (and subsequently vote). And as with many power structures (especially in the arts scene), there is a massive block of ageing white baby-boomers. Why is the voting block going to be filled with massive amounts of old white guys? Because most people who are 1) interested in being a part of The Academy and 2) have that many credits are generally from the artists from the 70’s, 80’s and 90’s, when black culture wasn’t exactly as mainstream in the media as it is today. Hopefully The Recording Academy isn’t as lily-white as the Academy of Motion Picture Arts and Sciences (the people who run the Oscars), who are sitting pretty with 94% white voting members. However, it’s unlikely that such results would occur and so many black artists would be snubbed if The Recording Academy did not echo – at least in part – the demographics of Oscars’ voting panel. But does all of this actually mean that The Recording Academy – and subsequently, The Grammys – are racist? Not necessarily. In an article penned in 2014, Rob Kenner explained what it was like being a voter for The Grammys. For starters, he notes that not every voter knows every artist (although you’d have to be living under a rock to have never heard of Beyoncé). Voters are only supposed to vote in their fields of expertise, but everyone can cast a maximum of nine ballots for nominations. In addition, every member receives a vote each for Record of the Year, Album of the Year, Song of the Year, and Best New Artist. Kenner gets to the bottom line: most of the nominations are chosen by people who have very little experience or knowledge in the field. The actual voting is worse, with members being able to vote in up to 20 categories, plus the general four. So the system is a mess, that much is clear. But is it racist? Or at least, as racist as people are quick to claim? Well, kinda. Does not liking or being familiar with the music of an artist who has been nominated make a voter racist? No. As Vince puts it, being unaware of a particular artist doesn’t make someone racist. But is stacking the room in with primarily people who know and like “white music” over “black music” racist? Yep. The reason many voters are either unaware of or don’t like a black artist is more likely to be that the industry is, or at least used to be, fundamentally white-leaning. Commercially successful albums are by and large less confronting and more accessible than those which might really say something, cause controversy, or at least comment on the world. This is why Macklemore and Ryan Lewis beat out Kendrick to win Best Rap Album, and why To Pimp A Butterfly, which has categorically been considered one of the most important albums in decades, lost out to 1989. Is it a race issue? Yes, but the problem doesn’t lie solely in the hands of the awards. Basically, don’t blame the awards: blame the industry that has historically kept black people under-represented in the circles that decide the winners. So resist the urge to start tweeting #GrammysSoWhite. Resist the urge to tell people who think that Adele was justified in winning Album of the Year that they’re racist. Saying that the The Recording Academy is the root of the issue may seem like a simple statement, but it’s an important distinction to make. It’s the difference between a racial issue out of malice and a racial issue out of sheer ineptitude. Features adele, Beyonce, Grammys. permalink.